This 1920 Mabie Todd is a “Jackdaw” Toledo lever-filler in Damascened-inlay overlay on Woodgrain Hard Rubber. Damascening is the art of hand inlaying different metals into one another, typically, 24K gold or fine silver hammered into a darkly oxidized steel background, to produce intricate patterns and designs. The English term comes from a perceived resemblance to the rich tapestry patterns of damask silk. Often called “Toledo” because much of the art comes from Toledo, Spain, a steel working center since about 500 BC (still doing damascening today). The cap & barrel each with two dragons and other flourish designs. Jackdaw was Mabie Todd’s student level pen, but generally of good quality (often even better than their “Blackbird” model pens) and are rare today. The theory is that because of their quality and price point, parents tended to buy lesser prices pens for their kids. 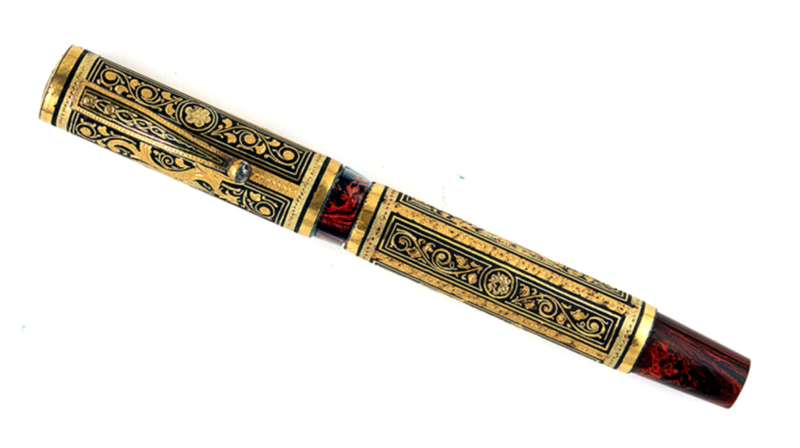 Then along comes this extremely rare pen with “Toledo” Damascene work! Nib and feed both signed “Jackdaw” (one of the famous fine, triple-flexible Jackdaw nibs!). There are less than a handful of these known to exist. Incredibly fine and beautiful work! A few signs of wear here and there, otherwise near mint. Item #3 in Catalog #83. 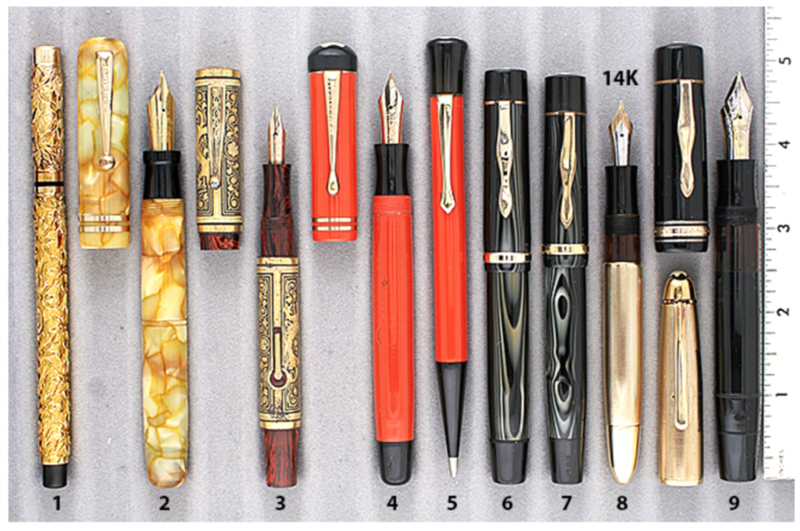 This entry was posted in Vintage Pens and tagged Catalog, Catalogs, Extraordinary Pens, Fountain Pens, Go Pens, GoPens, Mabie Todd, On Point, Vintage Fountain Pen, Vintage Fountain Pens, Vintage Pen, Vintage Pens. Bookmark the permalink. Follow any comments here with the RSS feed for this post. Post a comment or leave a trackback: Trackback URL.